Camlock Couplings fluid fittings can work in pressure range from 5 Bar up to 18 Bar depend on Camlock Couplings size and material made. Sealing is realized by touching each other male and female by squeeze kind of rubber low pressure gasket. Standard Camlock Couplings made is supply with gasket made of NBR rubber (on request Hosemann supply Camlocks with gasket made of: EPDM, VITON, HYPALON, PTFE, THERMOPAC, POLIURETAN). 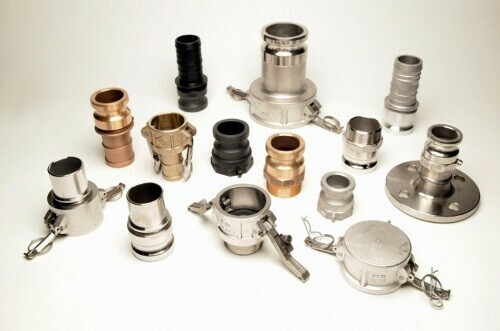 Standard Camlock Couplings is made with BSP thread. On request Camlock Couplings NPT thread available. Cam lock Couplings fluid fittings quick connections sizes ½” ÷ 6″ available from stock, other sizes on request.